Hanoi (VNA) – Vietnam always creates favourable conditions for foreign investors, including those with financial potential and modern management strength from Japan and the Republic of Korea, to do business in the country, said Prime Minister Nguyen Xuan Phuc. 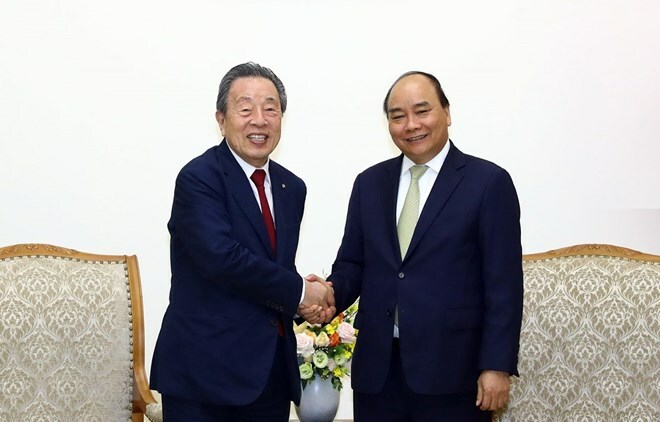 PM Phuc made the affirmation at a reception for Chairman of Japan’s Maruhan Corporation Han Chang-woo in Hanoi on April 1, during which he thanked Han for his efforts to promote Maruhan’s investment in Vietnam. The Vietnamese leader congratulated Maruhan on its investment and business achievements in many fields such as banking, insurance, construction, food production, and entertainment services, saying that Vietnam has devised a strategy on banking development till 2025 with a vision to 2030, towards serving the country’s economic development. He stressed that Vietnam attaches great importance to foreign investors and wishes to attract more foreign investment in the fields of Vietnam’s need, such as finance, banking, infrastructure, high-tech agriculture, and innovation. For his part, Han congratulated Vietnam on its socio-economic achievements in recent times, and the successful organisation of the second DPRK-USA summit which, he said, helped increase Vietnam’s prestige on the international arena. He expressed his belief that Vietnam’s economy will continue to develop with greater strength in the future, adding that Maruhan wants to enhance investment in Vietnam and contribute to the country’s development. PM Phuc noted that Vietnam’s economy has recorded stable growth in recent times and that this presents a good opportunity for investors as Vietnam is an attractive market for foreign firms, with some 40 billion USD worth of foreign investment poured into the country each year. The total foreign investment in Vietnam in the first quarter of 2019 was 1.5 times higher than that of the same period last year, he said. Prime Minister Nguyen Xuan Phuc.